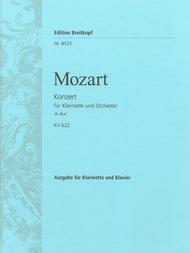 Klarinettenkonzert A-dur KV622 composed by Wolfgang Amadeus Mozart (1756-1791). Edited by H Kling / Trio Di Clarone. For clarinet (in A) and piano. This edition: paperback. Edition Breitkopf. Piano reduction. 56 pages. Published by Breitkopf and Haertel (BR.EB-8523).ISBN 979-0-004-17815-7.